Acoustic Energy's new Neo V2 Four looks like a lot of speaker for the money, but does more equal better? The latest addition to Acoustic Energy's extensive range is a substantial three-way at a very competitive price. But while it's easy to build a big speaker for a good price with Far Eastern manufacturing, it's another thing to make the speaker communicative and dynamic. Acoustic Energy has a strong track record for getting its designs right so what can we tell you about the new £700 NeoV2 Four? Standing 1,200mm tall this is an imposing speaker in a very smart finish (there's a black version and a Vermont walnut option – neither is real veneer, but you have to look twice to spot it). The driver array is pretty serious, too: a pair of 160mm alloy bass units combined with a 130mm alloy mid and a ring-radiator tweeter. And you don't need a monster amp to get it jumping; the high 91dB sensitivity means that most decent amps will be up to the job and the better ones more than sufficient in level terms at least. The NeoV2 Four comes with a separate bolt-on plinth that extends the footprint for greater stability and provides an anchor for the shiny floor spikes. It also comes with magnetic grilles, so that the front baffle is devoid of holes should you be sensible enough to run them 'naked'. Three reflex ports pepper the back of this speaker and these partly explain the high-sensitivity. Acoustic Energy recommends you place them well away from side and rear walls. A single pair of cable terminals keeps connections simple. The cabinet is built with 18mm MDF for the most part, with a hefty 32mm front baffle, where stiffness is most needed. It's unusual to see a ring-radiator tweeter at this price, as these drivers are taking over from domes at higher prices because they have wider bandwidth and lower distortion. The only drawback on paper, at least, is reduced dispersion. In terms of scale, this is a hard package to beat. The competition is devoid of anything over a metre high, but scale is not everything, of course, and we would expect the Bowers & Wilkins 684 to be a hard act to beat, this two-and-a-half way did well in its last Blind-listening Group Test and hits the same price point. We tried a number of alternative amplifiers with the Neo Four in order to find a good match. First up was a Cyrus Streamline, which is not particularly powerful, but revealed the speaker's strength in midrange projection. The bass proved difficult for the Cyrus to get swinging, however, and only the finest of recordings sounded timely with this pairing. A Cambridge Audio 840A brought out more body, space and low-level detail in the mix and added serious punch to dynamic tracks, but the bass seemed congested. Our final partner, the Rega Mira 3, did the trick; its excellent sense of timing allowing the speaker to start strutting its stuff. Now the picture hung together with aplomb and we were free to listen to the music rather than the equipment. With careful partnering this substantial floorstander is capable of revealing and engaging results. It's not quite as transparent as a similarly priced two-way standmount, but can muster a lot more bass extension and power. 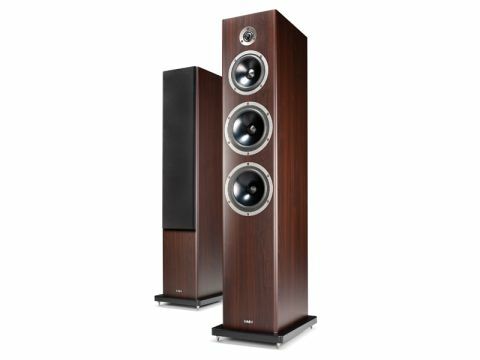 If you want to create a full-scale soundstage and immerse yourself in the music, then there is no substitute for large speakers. Bass is not totally open and the mid will be a shade exposed for badly matched electronics, but get these bits right and you have a surprisingly open and well-balanced speaker that can deliver a shapely bottom end and a detailed midband. It gets you up close and personal with the music.